This is George. He's a toad. 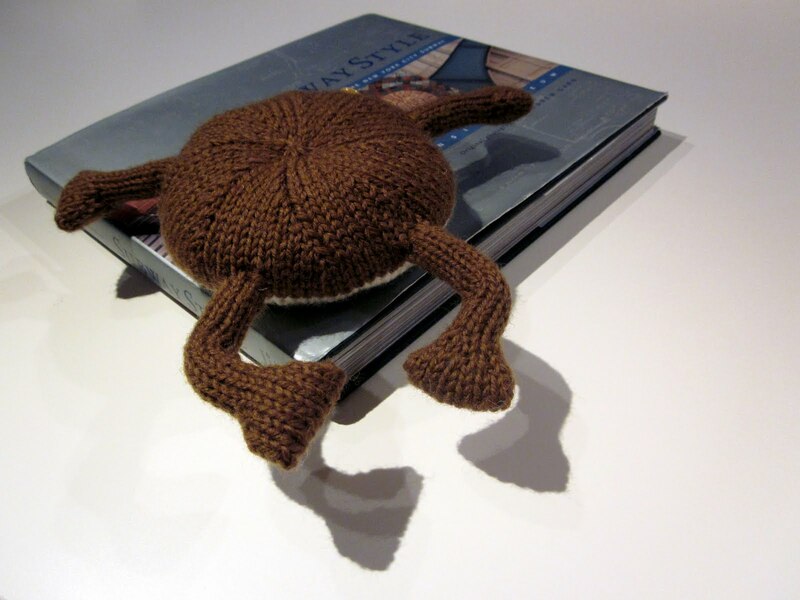 He likes slugs, long hops on dark rainy nights, and...hanging about in people's studios. George turned up in my studio late last July, just in time to help me bang out a new pattern (using LOFT, no less!) for Brooklyn Tweed's forthcoming publication Wool People 2. And yes, it is quite diffcult to work when someone won't get off the book that one is trying use...George. Luckily I knew of someone else who has a couple of lovely studios that I knew George would absolutely love. Besides, George shares Tom's predilection for flamboyant headgear. From what I understand they are now getting on quite well together, which makes me happy. I hope you're behaving yourself, George! Another thing that makes me particularly happy (happy? More like ecstatic as a raving crazypants LOON,) is WOVEMBER - the month-long celebration of REAL SHEEP and REAL WOOL that has been organized and executed by Kate and Felicity. 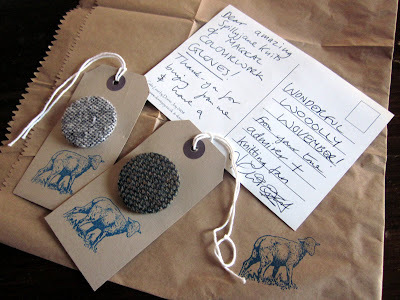 In a burst of utter JOY and LUST to celebrate WOVEMBER I promptly swooped down upon Felicity's Etsy Shop and picked up a couple of her limited edition WOVEMBER 2011 tweed-covered badges. They turned up in the post just the other day... ...accompanied by the sweetest note. Thank you, Felicity - I will now be properly decked out for the rest of this WONDERFUL, WOOLLY WOVEMBER. Baaa! Oh my, but he's cute! Love Kate; love those badges; love Wovember. November 11, 2011 at 10:42 a.m.
November 11, 2011 at 11:13 a.m.
November 11, 2011 at 11:53 a.m. I thought that was a crown on George's head -- The Crowned Toad, right? 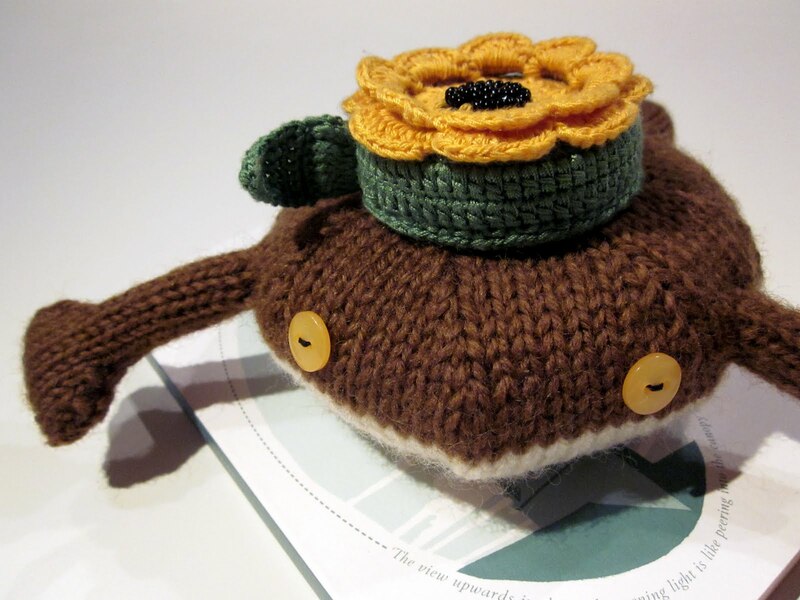 November 11, 2011 at 1:33 p.m.
What an adorable toad. Love it! 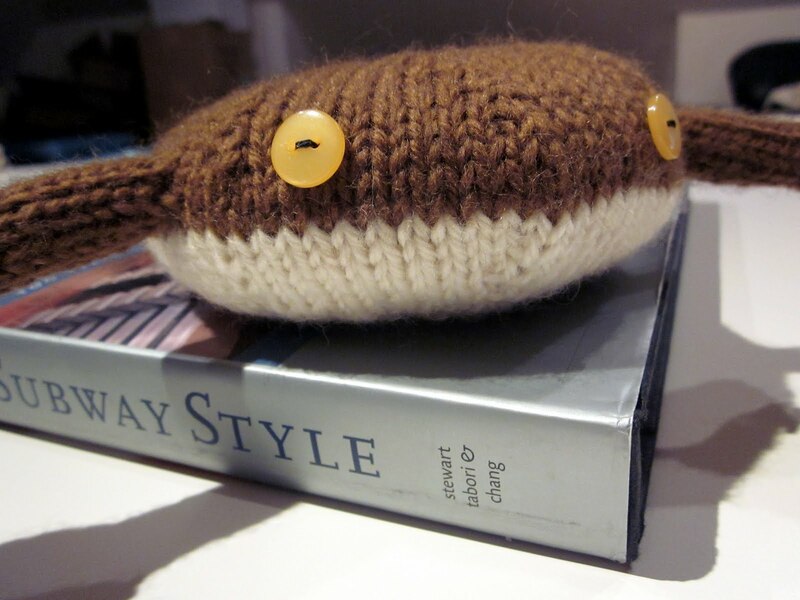 November 12, 2011 at 9:45 p.m.
Got a pattern for the toad? My 13-year old LOVES it and I'd love to make one for her for the holiday. November 14, 2011 at 5:55 a.m.
i just lost it over this toad. November 27, 2011 at 8:40 p.m.